The price sensitivity on domain renewals is known to be low, meaning that prices could go 2x and people would still renew their domains. Price sensitivity on new registrations is somewhat existent, but that can be managed thru first year discounts. That assumes registrar to be pushing prices up or down… the article is about registry pricing. We did a 1/3 registry price increase in a TLD and the renewal rates are steady. The problem for Tucows as a wholesale registrar (not only registries work wholesale) is that they don’t make money on value-added services. Most retail operations, be registrars or resellers, make little money on domains but good money on hosting, email, SEO, design etc. Cloudflare and their wholesale pricing is really attractive. Although the interface is quite raw and they don’t support long-term renewals – only 1 year at the moment. I did one transfer to them just to give it a try and it happened really fast. Now that the US Government reduced the amount of regulation on .com prices what exactly will registrars do? The representative data that you present here from a wholesale registrar, where resellers arbitrage prices daily, cannot be the entire picture when retail registrars like Network Solutions charge $40 for a renewal. Even GoDaddy recently increased the renewal price for a .com domain by $3. 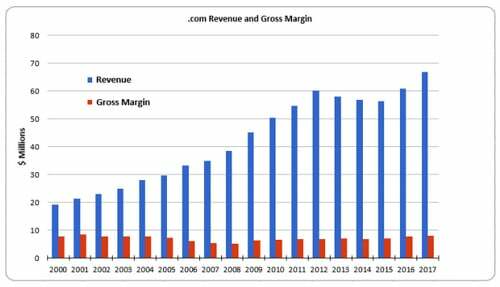 Over the next six years a registrant would be charged $18 more to retain a single domain with most of that going to GoDaddy and not Verisign. Don’t you think most registrars will pass on the increase in a similar manner? Why isn’t ICA going after GoDaddy’s pricing, which as you point out, is not regulated?